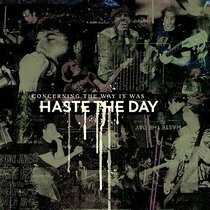 Concerning The Way It Was is a 37 song, 3-CD set including all the songs from three albums: Burning Bridges (2004), When Everything Falls (2005), Pressure The Hinges (2007) - all for just $18.99. This new anthology will be a great addition for fans that may not have all Haste The Day's best-selling catalog as well as a great way for new fans to discover and get all three catalog albums for a great price. Collections like this are a great way for stores to carry all of Haste The Day's albums in one SKU and make great gifts for the upcoming holiday season. About "Concerning the Way It Was (3 Cd Set)"